Cookie inspiration can be found in unexpected places. My black lab, Riley, needed a new collar and I wanted to get her a cute, cookie related collar to replace her worn-out cupcake collar which inspired me to make cupcakes (of course). I even made black lab "pupcakes"! On the search I found a couple of chocolate chip cookie collars, a Cookie Monster collar, and even a macaron collar (next in line), but when I landed on this Milk and Cookies (BFF) collar, I knew I had found just the right one, with cookie inspiration to boot:) (Can someone out there help me to kick this habit of adding smiley faces to the end of way too many sentences?!?) I guess I kind of like smiley faces, and these cookies offer more evidence. I have wanted to make decorated sugar cookies disguised as chocolate chip cookies ever since I first saw Callye's (of SugarBelle's) adorable version, and then Toni's (of Make Bake Celebrate) cuties. If you haven't visited their sites, you must! Callye is a cookie wizard, also offering helpful tutorials and support to other cookie decorators. Toni's site is full of happy, sweet treats and brightly colored sprinkles. The dog collar has "BFFs" on it. I wonder what the "s" is for? Best Friends Forevers?? Perhaps Best Forever Friends? Maybe they made a mistake. 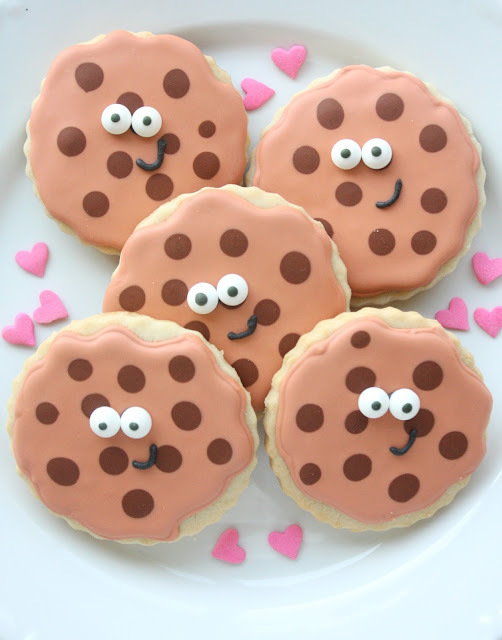 Give some of these cookies to your own BFF, or anyone that needs a smile. 1. Roll out dough (about 3/8-inch thick) and cut out shapes with cookie cutters. 2. Place cookies onto baking sheets and bake according to recipe. 3. Let cookies cool completely. 4. Divide royal icing into six portions (leave one portion white). 5. Decorate the cc cookies~For the choc. chip cookie base I mixed warm brown and added drops of ivory until I had achieved the color I wanted. Add the choc. brown gel to another portion of the icing for the "chips" and make sure it's the same consistency as the base icing. Working 2-3 cookies at a time outline and fill the base icing (#3 tip) and then add the chips to each cookie (#3 tip). This technique is called wet-on-wet. Let cookies dry completely, overnight if possible. 6. 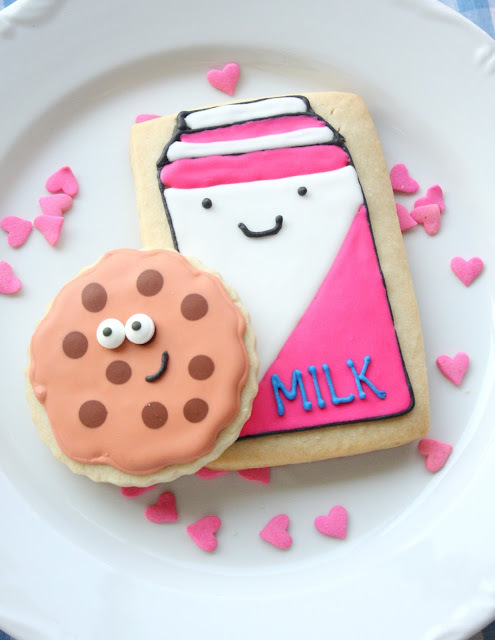 Decorate milk carton cookies~Freehand the shape (or make a template) and with an edible marker draw the carton onto the cookie. 7. Outline the milk carton with black royal icing. Let it dry for about an hour. 8. Apply the white icing to the carton (see photo). Let it dry for about an hour. 9. Add the pink tinted royal icing. Let the cookies dry completely (along with the cc cookies) overnight. 10. Attach the candy eyes with a tiny dab of royal icing. 11. With the black royal icing, add the eyes and mouth to the milk, and the mouth to the cc cookie. 12. Use the blue icing and write "milk" on the milk carton. I am speechless, Sue. You are truly a life artist! Those cookies look too adorable to eat. These are so cute - you are very talented! So stinking cute, Sue you make the cutest cookies! I love your inspiration for these cookies. The world is a different place to those who decorate food! Oh my gosh, you are too funny, Lisa! This put a BIG smile on my face:)! THANKS! Sue, you have cute down to a T! These cookies are just adorable! Amazing. The chocolate chip cookies are possibly my favorites of all your cookies. Simple but cute. 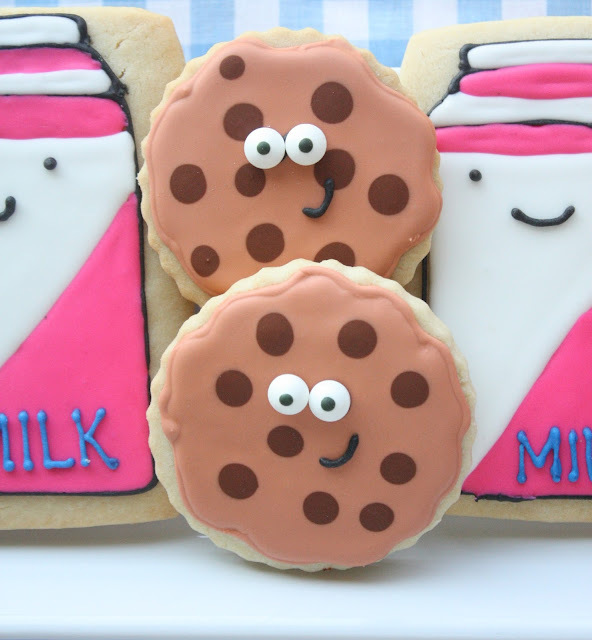 those cookies are so stinkin cute! Shhhhh I have serious issues with adding smilies to the end of EVERYTHING! I can't stop! And thanks for the sweet shout out..as always love your cookies! :) - oops! Super cute as always and I love the collar too!! All these cookies are really adorable and I should say that in order to create them one should not only have the talent of baker but also a talent of a painter! The only thing I wonder are all those food colorings are safe for kids? Hello cuteness! These are such happy cookies they make me want to smile...and I love how they are chocolate chip cookies in disquise-they are tricky ha!ha! The milk is just as sweet too! How perfect are these??? Adorable. 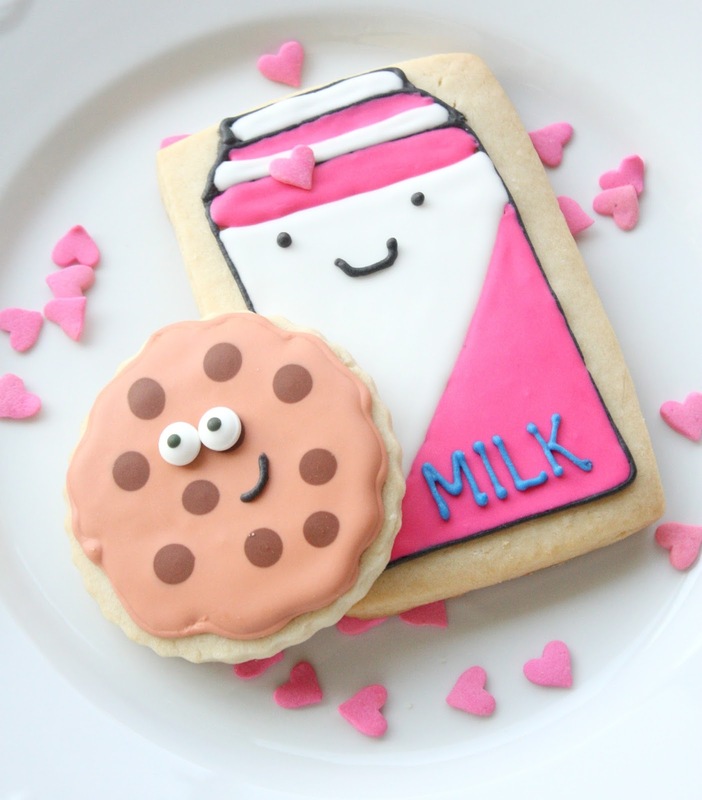 The little faces on your cookies are so simple but so effective - soo cute!